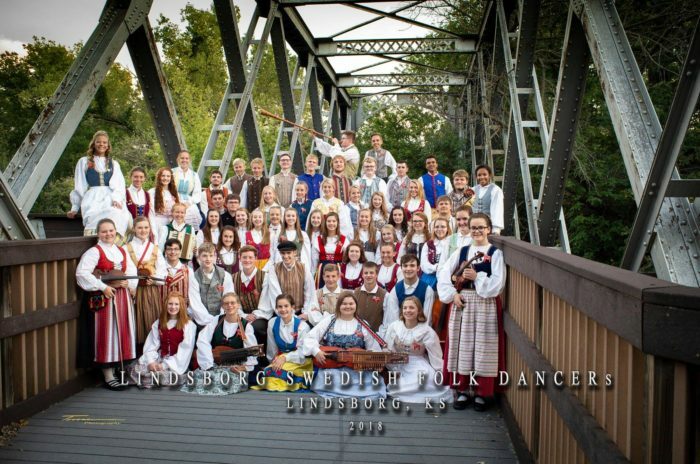 The Lindsborg Swedish Folk Dancers (LSFD), established in 1963, is a group of high school dancers and musicians dedicated to promoting the study and appreciation of traditional Swedish folk dance and music. This year the group includes a record 58 students! The annual group photo was taken on the Smoky Hill River bridge on Lindsborg’s Välkommen Trail. The 2.5 mile trail meanders through our beautiful city, free for public use year round. At the trail’s southern most end, you can enjoy the sights and sounds of nature as you walk across this refurbished railroad bridge. We welcome your tax-deductible contributions! © 2019 Copyright lindsborgswedishfolkdancers.org. Powered by WordPress & RN Design & Development.